This night was a real pleasure for moon lovers as it marks the third in a series of supermoons this summer. On Monday stargazers were able to view one of the biggest and brightest moons in 20 years – and with a reddened shade. "Because the moon is at perigee, or the closest point of its orbit, it's going to be about 13 or 14 percent bigger, optically, and ... about 30 percent brighter," Philip Erikson, principal research scientist at the Massachusetts Institute of Technology's Haystack Observatory outside Boston, told Reuters. This moon is also called the Harvest Moon, which means that the full moon is the closest to the autumn equinox, on September 23. The term Harvest Moon comes from the days when farmers relied on moonlight to tend to their crops during the night. "Whether we call this a super Harvest Moon or a Harvest supermoon, and whether we fuss over the fact that lunar perigee happened just one night before this moon was full, there's no denying that it's the Harvest Moon," Slooh astronomer Bob Berman said in a statement, reported Space.com, space and astronomy news website. "This is the year's most famous full moon, and one of only two that even have a name. Yet it's bathed in myth and misconception even without all the extra 'supermoon' business. It will be fun to explore the true secrets of the Harvest Moon while watching it live," Berman added. 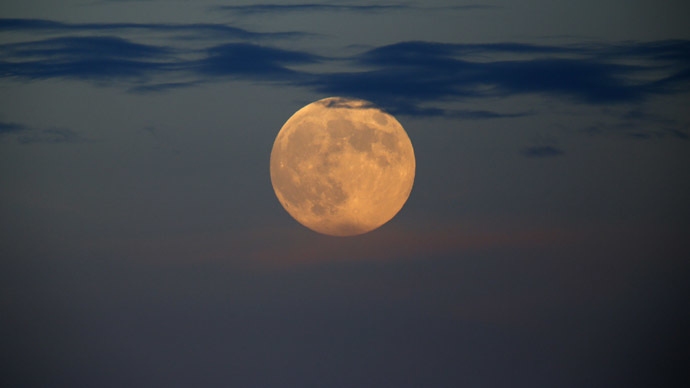 The Harvest Moon usually marks the beginning of autumn, but this time the giant moon is falling early and is considered as the last full moon of the summer 2014. The moon got its full phase when it reached the spot in the sky opposite from the sun. That moment occurred Monday at 0138 GMT. 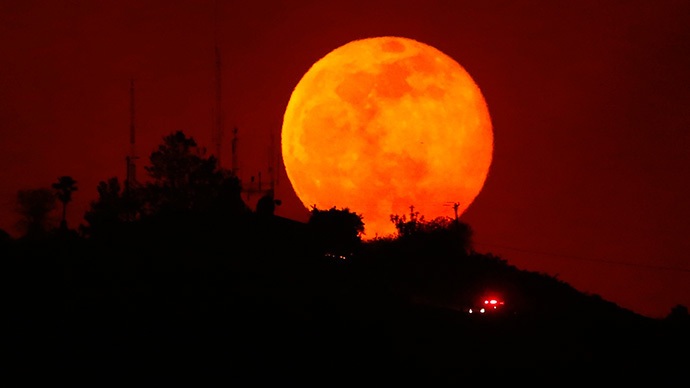 According to the scientists, September supermoon is redder than usual at moonrise as its angle of rise is low. "It's a good reason to look up, because it's a good, bright, full moon," said Amanda Thompson at the Boston Museum of Science's Hayden Planetarium. "You will be able to see the maria on the moon, which are the dark, smooth areas. Those are cooled-off lava flows." Monday’s supermoon is the third in a trio of supermoons this summer. The previous supermoons were seen on seen on July 12 and August 10, resulting in spectacular images and prompting millions to crane their necks to see the phenomenon. August’s supermoon was the largest of the three to appear this summer. 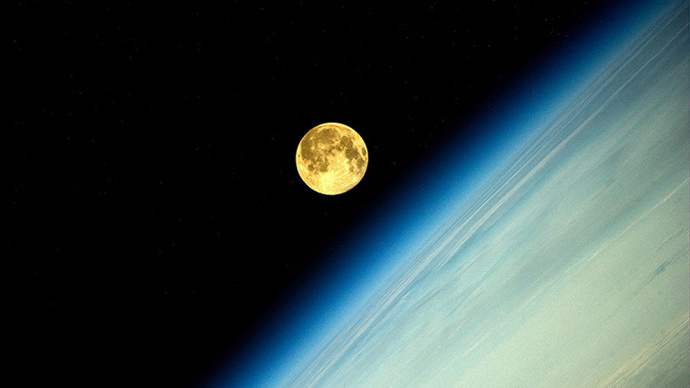 September’s giant moon is not the last supermoon in 2014. The next one is expected October 7-8.